Cincinnati Board of Education has placed on this November’s ballot a 9.11 mill levy. COAST characterized this as an “increase” in a headline in this newsletter article. COAST did so for two reasons. First, every levy is a tax “increase” if one considers what the taxes would be in the ensuing year if the governmental agency had simply let this levy expire. This new tax rate on an expiring tax is called the “base” and the new taxes would be higher than the base if the tax levy did not pass. So, each election year when a slick campaign commercial says “it won’t raise your taxes,” smile, laugh and say “um hum, sure it won’t.” The fact is your taxes will be higher with the new levy passing than it would be without, and COAST calls that a tax increase. We are glad to allow others to call it what they want. Second, COAST called it a tax increase because as it understands tax levy terminology, most “renewals” are in fact levies with constant (from the prior taxing period) millage rates. When those constant millage rates are multiplied times new, higher real estate valuations (as most Cincinnati homeowners experienced in 2009), the actual taxes paid increase. COAST incorrectly argued that this tax was also such an increase. In fact, according to David Nurre from the Hamilton County Auditor’s office, this levy is an unusual one in that it generates the same amount of money as the expiring levy – i.e., constant dollars. This means – roughly – that if your home value went up, on average, the same as the City school district average your taxes would stay roughly the same in dollars as the last levy period, and your rate (dollars per thousand) might even go down. So, COAST admits it – we were wrong, and desire to engage in some self-flagellation to make things right. Fortunately, this act of cleansing allows us to go forth and oppose the oppressive rates of taxation foisted upon us by CPS and redouble our efforts opposed to their confiscatory levy – and point out the piss-poor results they get from the gobs of money the spend mis-educating the youth of Cincinnati. Now, other than picking that crow gristle out of our teeth and that nasty crow aftertaste, we feel so much better. 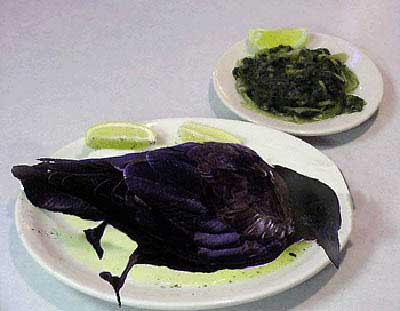 That photoshop is so good I can't tell if there's a real crow on that plate or not. ^Crow season in Ohio opened on June 5, 2009 and closes on March 14, 2010. Crow hunting is only permitted Fridays, Saturdays, and Sundays, but there's no bag limit. Of course, COAST would consider the expiration of the Bush tax cuts without renewal a "tax hike". BTW, I couldn't tell what that photo was supposed to be until I looked at the comment about crows. Good work guys. I see you're spending your time well.